As a college student there is one thing I always wish I had more of -- time. Between schoolwork, athletics, extracurricular activities, and parties who really has time to cook a homemade meal? These five recipes are all simple and quick enough to make on a school night when you're sick of cafeteria food, and they're sure to give you the nutrients you need as you gear up for finals. 1. Cacio e Pepe. I got hooked on this classic (and delicious) Roman pasta dish while studying in Italy. You can feed a large group with practically no effort and is a major go-to of mine for big group dinners. 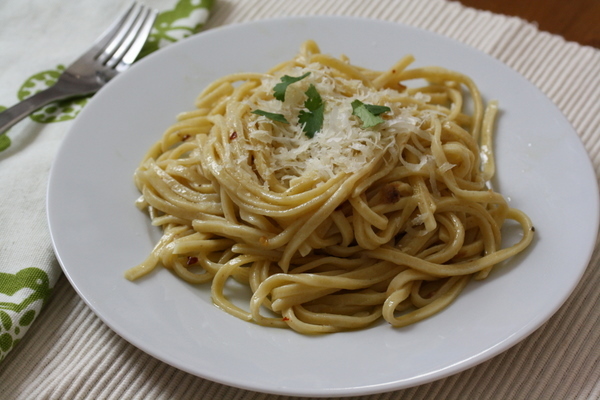 Since cacio e pepe was originally a dish for Roman peasants, it's budget friendly too. 2. Pan-Seared Filet Mignon. This luxurious meal is actually very quick and simple to make. With a glass of red wine, it makes a great date night meal! 3. French Quesadillas. This meal is dinner and dessert in one. It also makes a great appetizer or hors d'oeuvre for a party. Serves as many as you want! 4. Perfect Scrambled Eggs on Toast. Breakfast for dinner. I have to confess that I generally find scrambled eggs to be pretty gross. Most are dry and tasteless, like cardboard. The crème fraiche in this recipe makes all the difference. These eggs are rich and creamy and certainly not tasteless. Experiment with fresh herbs or other cheeses. 5. Spicy Greek Orechiette. I made up this pasta recipe for an unplanned group dinner when I found myself with practically no ingredients at home. I modified over time and now serve it both hot and cold -- save the leftovers for lunch! Orechiette (or "little ears" in Italian) are my favorite kind of pasta -- the shape is perfect for holding sauce or, in this case, cheese. If you can't find orechiette though, any small pasta shape will work (like shells or macaroni, for example). 6.BONUS! Nursery School Cookies. These cookies go by many names but growing up my mom always called them "nursery school cookies." Mom knows best so I'm sticking to it. This recipe is the first I ever learned and is so easy a nursery schooler could do it. Katharine spent her junior year indulging in delicious food (and doing a little studying) in Lyon, France and Bologna, Italy. Back home, she loves cooking Ina's Perfect Roast Chicken.